Welcome to the Most Educational Swimming Pool Blog in the Country! With the cost of fuels, natural gas, and propane having skyrocketed in the past five years, many pool owners are now choosing heat pumps as their means of pool temperature regulation. In fact, heat pump installations out-numbered propane/natural gas heater sales 10 to 1 in 2008 for our company. This article will break-down the science behind heat pumps and will also discuss why so many people are choosing to spend more up front in order to enjoy the benefits of a heat pump for many years to come. To start, unlike gas and propane heaters, heat pumps work off of electricity. Their pumps work much like a central air conditioning unit in reverse. The big difference between a heater and a heat pump is that the heat pump extracts existing heat from the environment, rather than making the heat. The process of moving heat from one place to another is almost always cheaper than generating heat. Heat pumps extract the heat from the air and transfer it to the pool water by compressing and superheating a refrigerant with a compressor. This refrigerant then passes through a heat exchanger, which then passes the heat into the swimming pool. When one compares the monthly savings average on a heat pump versus a gas/propane heater, the savings are significant. In fact, the average monthly heating bill with gas/propane in the Va/Md. area is roughly $325. When compared to a heat pump's average cost of $75 per month, it is not hard to see how these devices pay for themselves quickly, depite the fact they cost about $2000 more upfront than I gas/propane heater. 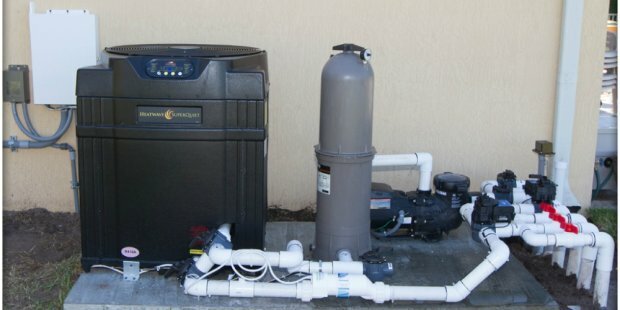 In addition to saving pool owners money each month, heat pumps are simple to use, easy to install, and can withstand more wear and tear than conventional heaters. Conventional heaters(gas/propane) are typically made of copper, a material that can chemically be eaten quickly if the pool owner doesn't maintain proper pH. Heat pumps, in essence, can be a thermostat for a swimming pool. With their simple touch pad displays, one can easily set the temperature and have the ultimate temperature consistency in their swimming pool.